They keep your cables neat and safely fixed in a large 24 x 16 mm outside duct and are sold in pairs. Large 24 x 16 mm outside cable duct. Tight, secure fit. Product type Stands and Tripods. For number of cables 2 pcs. 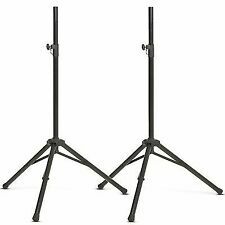 2x Thor S-16 Professional Heavy Duty PA Speaker Stands (35mm). Professional grade tripod speaker stand. Material: Steel. SWL: 60 kg. 3.2 kg (Single Unit). 146 x 126 x 975 mm. Material: Steel (pole and plate) and nylon (joint). load: 25 kg. Top plate: Square, sturdy. 2.75 kg (per stand). Top plate: 230 x 230 mm. Bottom plate: 240 x 240 mm. To fit Gravity speaker stands. Built for durability and longevity, Gravity products are constructed from premium quality materials, such as heavy-duty aluminium and steel, tough die-cast zinc and hardwearing thermoplastics. Maximum load: 20 kg (44 lb). Extension height: 82, 87 or 92 cm (32.3, 34.3, 36.2"). Weight: 3.75 kg (8.3 lb). Material: Steel. Distance between the fixing pole and the steel structure: 28 cm (11"). Compatibility with speakers: 73-cm-(28.7")-high speakers or smaller (10" and 12" speakers and most 15"). 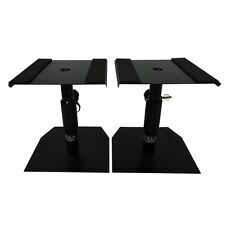 2x Omnitronic GB-1 Gable Speaker Stand Adapters. Stand adapter for 2 speaker systems. Maximum load: 2x 20 kg. 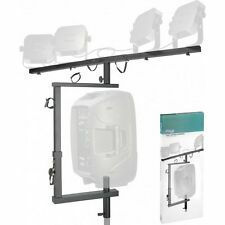 Professional gable bracket to fix two speakers to one stand. Locking bolt (H x D): 120 x 35 mm. 35mm External Top Hat. Max Load: 15 kg. Weight: 0.419 kg. 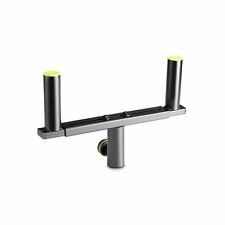 PAIR Proel Speaker Stands 35mm. Condition is Used. Unfortunately I don't know much about these, what you see is what you get!! Grab yourself a bargain, I will happily sell these for 1p!! Collection in person only please. 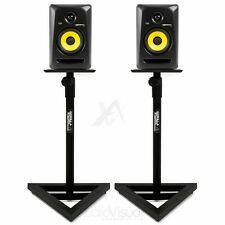 These Vonyx SMS20 Studio Monitor Speaker Stands are firm and durable support stands for correctly positioning speakers and monitors. The stands have a triangular base to offer stability along with rubber pads to stop any slippages. 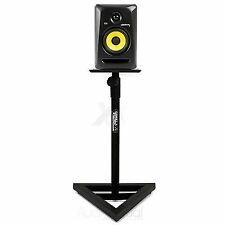 No matter what kind of setup you have, these Vonyx speaker stands will add an extra touch of professionalism to your home or studio. The sturdy triangle bases include floor spikes for extra stability. VidaXL Speaker Stands 2 pcs Tempered Glass 1 Pillar Design Silver. Material: Tempered glass plate aluminium pillar. 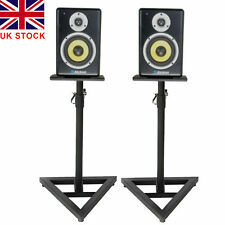 Enjoy the quality of your free standing sound system with our pair of speaker stands. Material: Tempered glass plate aluminium pillar. 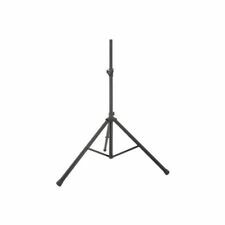 Enjoy the quality of your free standing sound system with our pair of speaker stands. Its modern design combines glass and aluminum and will fit any interior. For desktop use suitable stands are available from ADAM Audio that are designed to enhance the acoustic setup of the following models: F5, A3X, A5X, ARTist 3 and ARTist 5. These stands align the tweeters to ear level, minimize direct desk surface reflectlions and by doing this, optimize the amount of primary sound. In a black finish. Why people choose us. Why people choose Bop DJ. Maximum load: 20 kg (44 lb). Extension height: 82, 87 or 92 cm. Weight: 3.75 kg (8.3 lb). A speaker tripod allows you to mount your speaker higher, getting better sound at events. There are a number of tripod stands for you to choose from based on the equipment that you have. 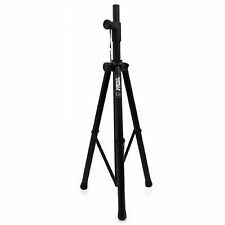 Explore eBay to find the reasonably priced speaker tripod stands that you need. What are some of the top features? There are quite a few features to look forward to in a tripod stand. You can decide which ones are important for you based on the speakers you have and where you're going to use them. Adjustable height: Adjust the height to get the level of sound that you want. Lightweight: The speakers are lightweight, making them easy to carry around. Portable: The tripods fold down, allowing you to take them from event to event. High load capacity: The load can be 60 kg or more per stand, ensuring it can hold the speakers. What are the mount options? It's important to look at how the speakers are going to sit on top of the tripods. Depending on the brand of your speakers, you can find tripods of the same brand. There may be brackets that will connect to your speaker. You can then ensure that the bracket clamps into the top of the tripod, providing the stability that you need. There may also be shelves, allowing you to set the speaker on top. The kind of event you're using the tripods at will determine what kind of mount will work best for you. 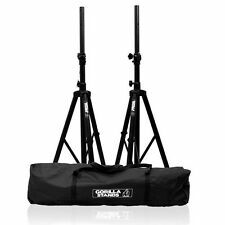 What is commonly included in a speaker tripod set? You will typically find a few different items included in a set. This will provide you with what you need to boost the height of your speakers so that they don't sit on the ground. Two speaker tripods: Mount two speakers with the two tripods that are included, allowing you to have one on either side of the stage or room. Carrying case: Make it easy to carry around the tripod stands. Instruction manual: Find out how to mount the speakers and make adjustments. What might be in a custom bundle? Whether you're a DJ or you simply want to enhance your sound at an event, there may be custom bundles on eBay to provide you with more of what you need. All sorts of things may be included with your speaker tripod.